The character cannot be deciphered. Though Wu Kanshu [1747 – 1803] had thought it was a composite design of the dragon and the fenghuang,nothing could be proven. The matter must remain unsolved. The style of the seal script is wonderful, exuding an antique flavour. Mr. Xue’s Inscriptions determined it to be a Shang-dynasty vessel, and that tenet has remained unchanged. Copied by Jingshan. Wu Dongfa (1747 – 1803), courtesy name Kanshu, wrote works on epigraphy and ancient classics. Mr. Xue is the twelfth-century Xue Xianggong, author of Inscriptions on ancient bronzes, a work often consulted by Qing scholars. 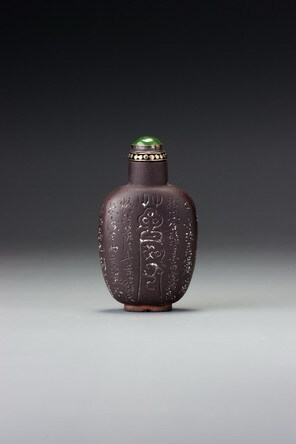 This is one those rare bottles that has a functioning seal as its foot, making it both a snuff bottle and a scholar’s seal. We are not entirely certain of our reading of the second character, but it may be the character ren, in this case a name, its conventional formalization manipulated by the seal carver for artistic ends. 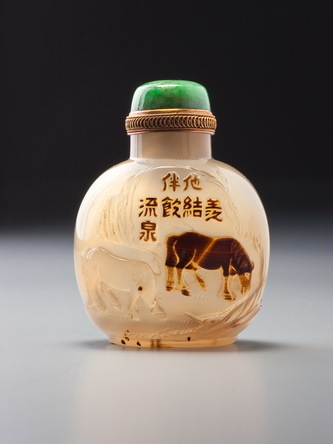 Unfortunately, we have not discovered the identity of Jingshan—the name was used by several Qing figures, but we have no reason to pick one of them as the owner of this bottle.